With this system, if you are an affiliate you will be rewarded when someone signs up for FC2 Video Premium membership through a video uploaded by you or through a FC2 video player pasted by you onto an external site. *Links on external sites must include a verification code. *Even if a visitor came through somewhere else other than outside link, the reward will be given to the submitter. A submitter and recommender can get up to 50% of their user's membership fee in reward points. The reward points can be redeemed to money by first being converted to FC2 Points. Please see the manual to learn more about FC2 Points. Just upload your content as usual, then other users will copy the video's external setting code, paste it to a site and then when someone watches your video and signs up to be a premium member you will receive 25% of the subscription fee. 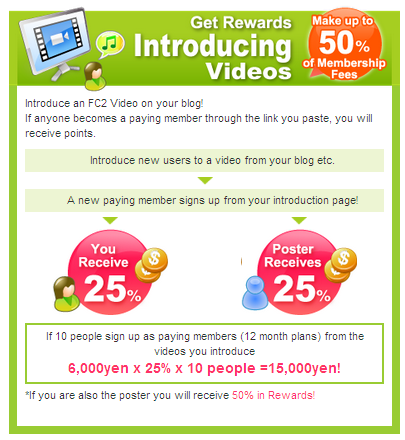 If a visitor signs up for Premium membership directly from the FC2 Video page, you will receive 50% of the fee. The more your video becomes popular, the more you can earn. Make good money by uploading a lot of fun content. Log in and copy the external player code for the video you want to paste and attach it to a blog or other site. The "Affiliate Tag" won't be shown unless you are logged in and without the tag you won't get paid even if someone signs up through your video. 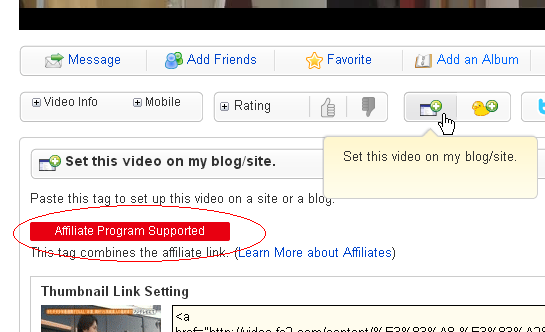 Make sure that you log in and that a message saying "Affiliate Program Supported" is shown. A verification ID is included in the tag, so when someone becomes a premium through the link, the sign up will be recorded. *The code of the account you logged in to will automatically be acquired. If you want to use this affiliate function under other account you have, log in with it and acquire a new tag.